Does Asteroid Crater in Ocean Explain Birth of Antarctica? A giant crater found under the Timor Sea could turn out to be the biggest known to have hit the Earth and — may even have been responsible for creating Antarctica. The crater was discovered by scientists from the Australian National University. A crater in Siberia currently weighs in as the largest asteroid strike on Earth, at 62 miles wide. However, the crater discovered by the ANU has so far only been measured according to the width of the base of the mountains surrounding it. The biggest — Mount Ashmore — measures 31 miles at its base, according to ANU extraterrestrial impact specialist Dr Andrew Glikson. “The minimum size of the Mount Ashmore dome … is 50km at the base, but the full size of the impact crater — not yet defined — may be significantly larger,” Dr Glikson said. Only one other crater compares to the pair — the 53-mile-wide Chesapeake Crater in the ocean floor off Virginia. Dr Glikson said the asteroid hit the Earth during a period of intense bombardment 35 million years ago. Its strike coincided with a sharp fall in global temperatures which in turn preceded the formation of the Antarctic ice sheet. Both the Siberian and Chesapeake asteroids hit at roughly the same time. And a million years later, the Drake Passage cut South America off from the Antarctica land mass, providing a constant flow of water around the ice sheet already forming as the Earth cooled. 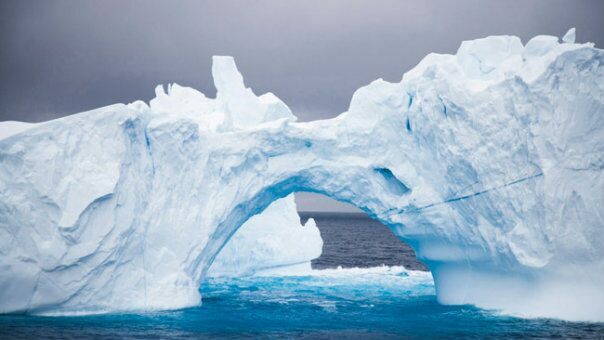 Dr Glikson said the Antarctic has since acted as a “‘thermostat’ for the Earth’s climate.” His research has been published in the Australian Journal of Earth Sciences. Posted on May 29, 2010, in antarctica, research. Bookmark the permalink. Leave a comment.